The article discussed here was forwarded to me on facebook via IFL Science. The story also appearing in The Conversation and ScienceNews (though apparently I'm a bit late to the party since the stories are from 14th Feb 2014). There's a seed of something interesting in the original paper referred to in the article (paper by Schein & Gayed), but it's interesting to note a few things wrong with the article and the paper itself. Quick summary: they claim to have discovered a new class of "equilateral convex polyhedra", the fourth such class apparently, after (1) Platonic solids, (2) Archimedean solids, and (3) Kepler solids. Equilateral meaning all edges are the same length. First thing that springs to mind is: what about the Johnson solids? What about prisms and antiprisms etc.? Seems the article left out a few important additional words from the original paper. The category's full description should have been: "equilateral convex polyhedra with polyhedral symmetry". Those extra words limit us to tetrahedral, octahedral and icosahedral symmetry, rulling out Johnson solids, prisms etc. Second, we all know the Platonic and Archimedean solids, but what are these "Kepler solids"? 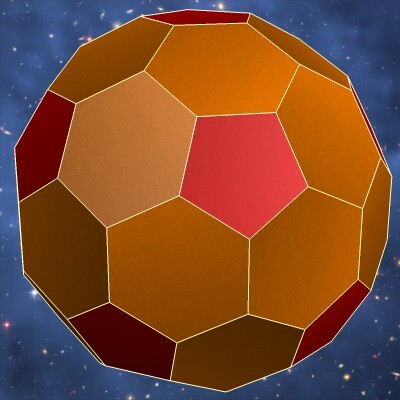 Kepler discovered a host of polyhedra, but "Kepler solids" is not a phrase I'd heard before. You may be familiar with the Kepler-Poinsot solids, but these are nonconvex, so it can't be those. The article describes these as "including rhombic polyhedra", and the original paper expands this as "the 2 rhombic polyhedra reported by Johannes Kepler in 1611". Ah, so this is the rhombic dodecahedron and the rhombic triacontahedron. So were these really the only 3 sets of equilateral convex polyhedra with polyhedral symmetry known before this paper? No! In fact there are infinite sets that were already known before this. Zonohedra and zonish polyhedra spring to mind. Let's look at some examples. Here's a simple zonohedron. This is easily made in Great Stella or Stella4D. Open a dodecahedron and from the menu select "Poly -> Zonohedrify" (or hit the keyboard shortcut Z), accept the default settings from the options that appear, and hey presto! That's equilateral and convex, but apparently unknown to the authors of the paper. We're not limited to just rhombic faces either. 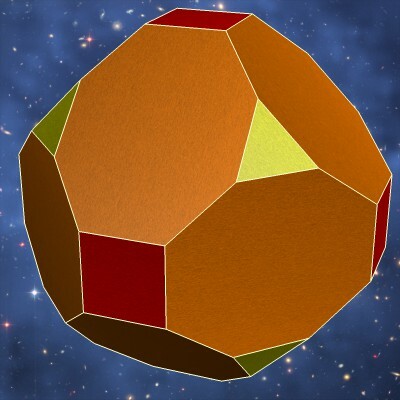 Start again with the dodecahedron, zonohedrify again, but this time change settings from "Zones only (create a true zonohedron)" to "Add zones to existing faces (zonish polyhedron)". Now you'll see quite a stunning zonish polyhedron, with pentagons, squares, rhombi and irregular hexagons as faces. And these sets are infinite! 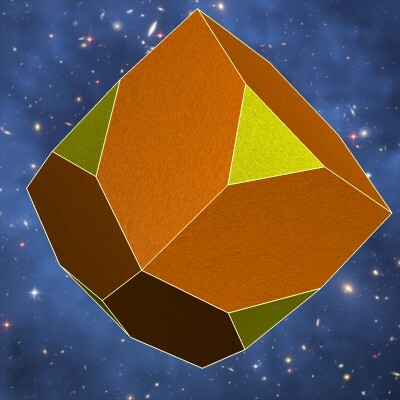 You can use any initial polyhedron as a seed (we used the dodecahedron above) to generate new zonohedra or zonish polyhedra, and choose to use any combination of vertices, edges or faces as a seed. You can even use another zonohedron as a seed, hence this set being infinite. If you zonohedrify the model above again (changing back to the "Zones only" option), we get this monster (still equilateral and convex!). Be a little careful here though if you wish to stay equilateral. Sometimes zones get combined to produce some double-length edges. This would have happened above if we'd chosen to create a zonish polyhedron. And if choosing to create a zonish polyhedron, you at least need to start with another equilateral convex polyhedron. But I digress. The article also implies that Goldberg polyhedra previously lacked planar faces. I'm not familiar with Goldberg's work, so this may well have been the case for his versions of the shapes, probably as dictated by molecular structures which care not for such things! But it is not hard to generate them with planar faces, and I've done this before without a second thought. 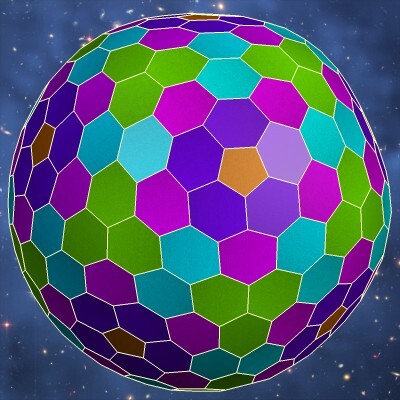 They are the duals of geodesic spheres, again easily created in Stella. 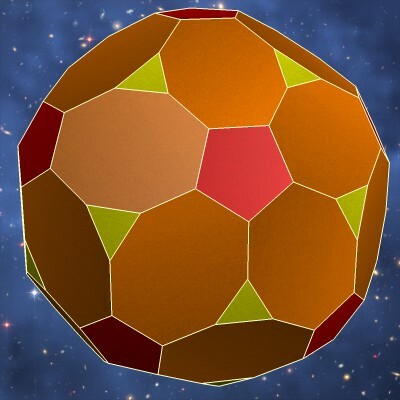 Start with an icosahedron, and from the menu choose "Poly -> Create Geodesic Sphere" (keyboard shortcut Ctrl+G). Enter whatever frequency you want, say 5, and hit OK. Now switch to the dual view to see a planar-faced Goldberg polyhedron. This one however is NOT equilateral, and the faces are no doubt more distorted than those created using Schein's method would be. Something for me to improve in Stella someday! 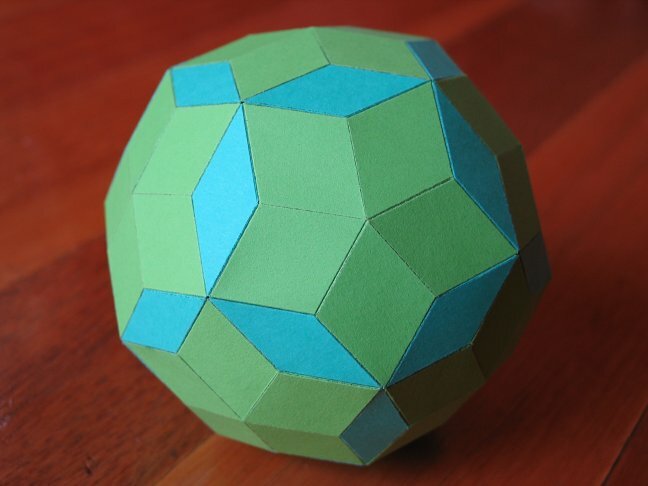 The novel thing arising from the paper for me is not that these Goldberg polyhedra can have planar faces, but that they can have all equal edge lengths. It doesn't seem too surprising though. The hexagonal arrangement gives a lot of leeway for internal face angles to change without changing edge lengths, but it's not something I'd thought of before. I haven't read the whole paper or tried to understand the maths involved. There's something about solving to remove the dihedral angle discrepancy between edges, but equal dihedral angles doesn't equate to equal edge lengths, so I'm not sure how they achieved that part. I think the dihedral angle thing was just to keep faces planar, with something else forcing the edges all to equal length. I think making use of duality would be an interesting approach though. 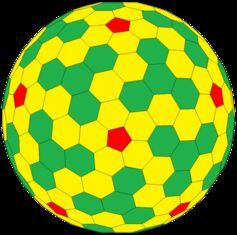 By starting with geodesic spheres, duals of the Goldberg polyhedra, the problem of keeping all those hexagonal faces planar goes away. The geodesic spheres only have triangular faces, which can't help but be planar, so you can adjust their vertices to your heart's content. 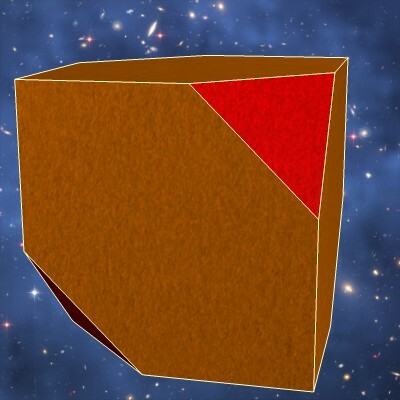 Then reciprocate when ready to get a Goldberg polyhedron, which is also guaranteed to have planar faces. The question though would be how to adjust the geodesic sphere so that its reciprocal would be equilateral. Yes, I think your remarks about the other types of equilateral polyhedron are spot on. I don't think I have yet found two equivalent definitions of a Goldberg polyhedron. One would have to go back and read Goldberg's original papers and see how rigorous he was - probably no more so than these guys. Flat (or positively-curved) faces are an obvious requirement for convexity in a surface, but if it is a cage then convexity is nigh-on meaningless. Certainly, the requirement for drawing a straight line that remains inside becomes meaningless - between two points where? and what does "inside" a nonplanar cage-face mean? 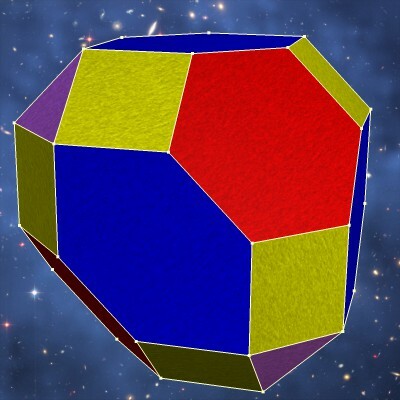 I would also add that they claim that Goldberg's figures were not really polyhedra. A shame they don't actually bother to define the polyhedra which they say exclude Goldberg's. Let's hope their thinking on the physiology of the eye is a little less wooly. Well Goldberg was interested in cages, and probably not interested in flat faces, because he was looking at molecular arrangements. I think these guys just realised, while doing the same thing, that they could expand this to say something interesting about polyhedra, as an aside to their molecular work. So they're not just talking about cages here. I thought this was clear from the context. They are saying that true polyhedra must have planar faces. I'm not saying that their definition is right, but I think that's what they're saying. I know there are skew polyhedra and so on, but I know I prefer my polyhedra with flat faces! 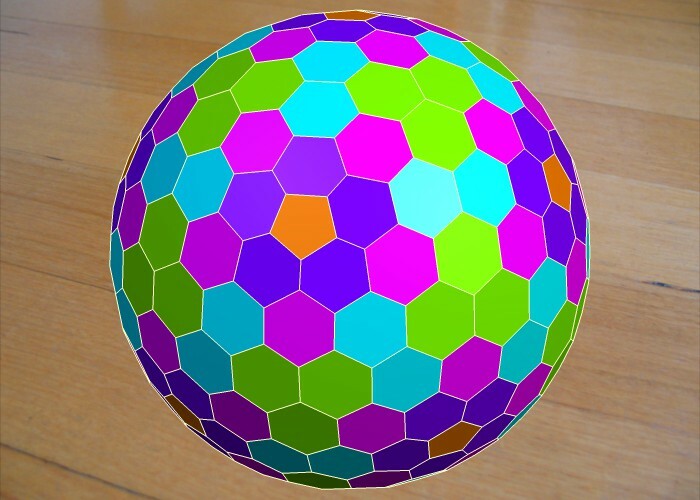 Now I really need to add Class II and Class III geodesic spheres to Stella so we can build all the different Goldberg polyhedra as their duals! 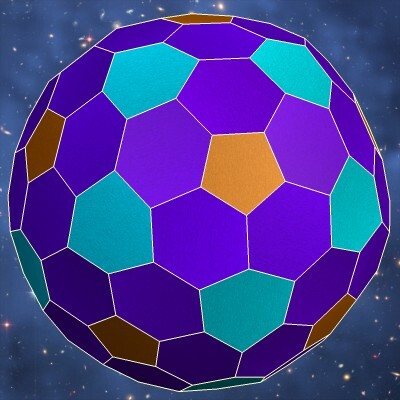 I also need a way to spread the vertices of geodesic spheres more evenly, and maybe even to generate Goldbergs with equal edge lengths as per the paper. robertw wrote: Well Goldberg was interested in cages, and probably not interested in flat faces, because he was looking at molecular arrangements. I think these guys just realised, while doing the same thing, that they could expand this to say something interesting about polyhedra, as an aside to their molecular work. So they're not just talking about cages here. Goldberg's original papers talk of operations such as truncation and bevelling. Bevelling especially is awkward to define for a cage. Goldberg also talked specifically of convex polyhedra. As I have already pointed out, convexity is even harder to define for a lattice. It is clear from this context that he is discussing flat-faced polyhedra. 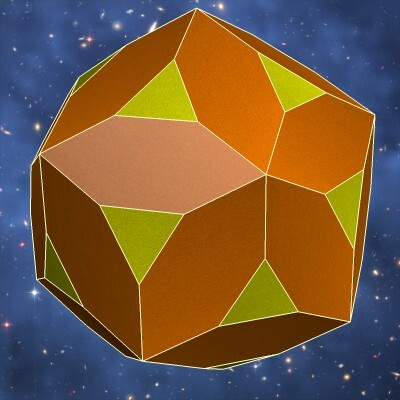 George Hart among others has used the term "Goldberg polyhedra" in this context. The assumption that, because he was professionally interested in lattices therefore his polyhedra must have been lattices, is unjustified. So too is the apparent assumption that nobody else has trod this path before them and they have something novel to say. I thought this was clear from the context. They are saying that true polyhedra must have planar faces. Au contraire, unlike Goldberg's the context here is entirely unclear. Did they reject Goldberg's figures because they were assumed to be cages, or because the assumption of cages was further assumed to allow skew faces and some kind of "lattice non-convexity", or perhaps for some other reason? With no definition to base their assertions on, one cannot say. Consequently one cannot say whether their critique of Goldberg has any shred of justification left clinging to it. robertw wrote: I also need a way to ... maybe even to generate Goldbergs with equal edge lengths as per the paper. I think that will require the solution of multiple simultaneous equations, there are no shortcuts for such arbitrary metric equalities in projective reciprocation. 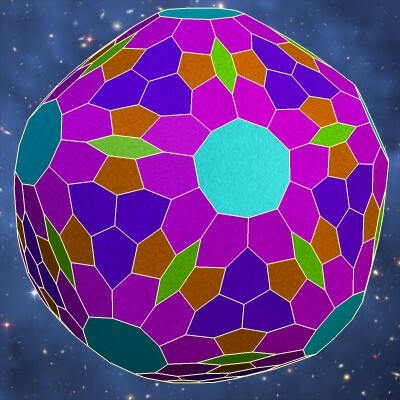 Can one even assume that all the vertices lie on a sphere? I think that will require the solution of multiple simultaneous equations, there are no shortcuts for such arbitrary metric equalities in projective reciprocation. Actually I just did an experiment with Stella's spring model (which I used to create the Johnson solids and for "Poly->Try to Make Faces Regular") and got it to create equilateral polyhedra without concern about regular faces. So, that allowed me to generate a few more examples of equilateral convex polyhedra with polyhedral symmetry. Finally, here's a couple of Goldberg polyhedra I made using this new feature, to give them equal edge lengths. 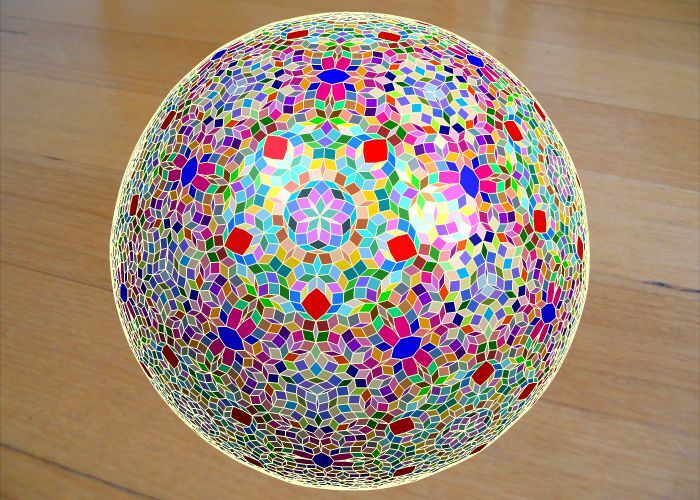 Can one even assume that all the vertices lie on a sphere? No, I would presume that the vertices are unlikely to lie on a sphere. 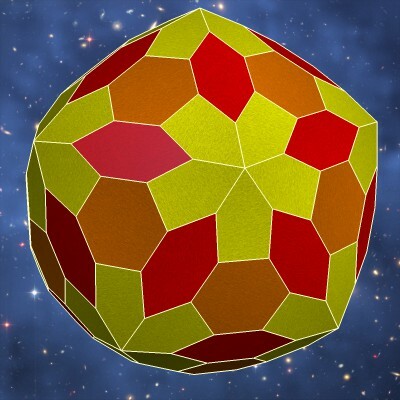 If anything, geodesic spheres' vertices lie on a sphere, so their duals, the Goldberg polyhedra, would have faces that are tangent to a common sphere. But after distorting them to force some additional property to hold, I would no longer expect that either. Last edited by robertw on Sun Nov 02, 2014 2:21 pm, edited 1 time in total. By all, that's wonderful. Why solve equations when you can jiggle about? 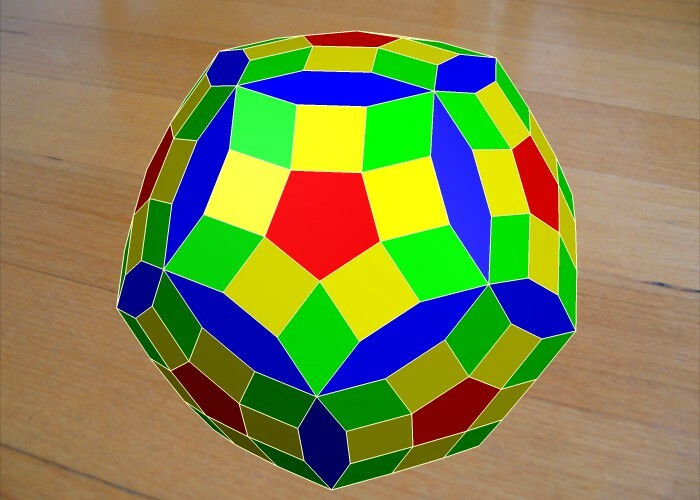 See also the idea to collect polyhedra with faces of same size. Thanks Eduard, looks like you already found some of the ones above. 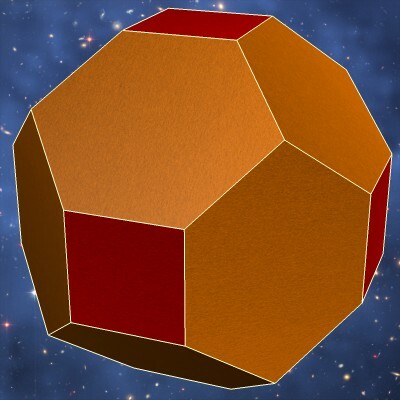 For others, the direct link to Eduard's PDF about equilateral polyhedra is http://www.baumanneduard.ch/Polyeder.pdf (not in English). And finally I should mention that one of the truncated rhombic triacontahedra shown above is also a Goldberg polyhedron, so not an example of one that was missing. I've also just realised that pretty much every near miss included with Stella can be adjusted to an equilateral version. In fact, some of them are already equilateral! Might try to post some images tomorrow. robertw wrote: I've also just realised that pretty much every near miss included with Stella can be adjusted to an equilateral version. H'mm. Setting symmetry aside, are there any convex polyhedra that can not be adjusted to equilateral form? Whole families? Non-convex? What are the rules?